With vast mountains, lush national forests and plentiful waterfalls, North Carolina is a natural destination for zip lines and aerial adventures. In North Carolina, outdoor adventures are served with views that will take your breath away. 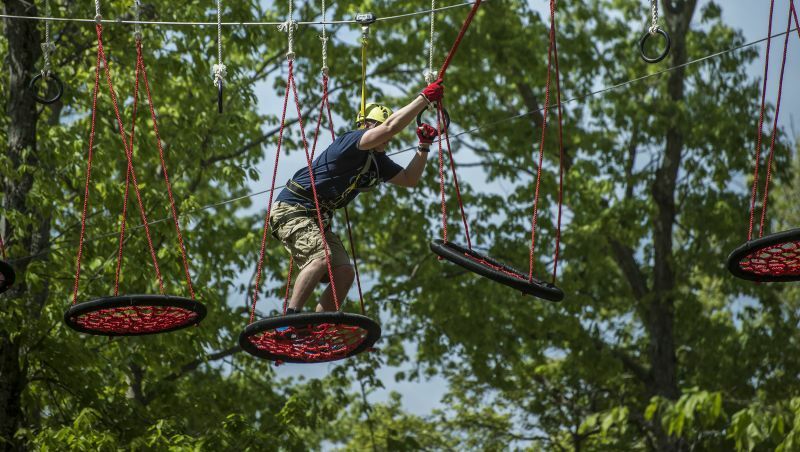 In fact, the nation’s first zip line canopy tour opened here in 1998, and over the last two decades the number of zip line and aerial adventure parks has grown tremendously across the state. These great outdoor experiences vary with the seasons: spring and summer find the canopy lush and the breeze inviting; fall turns the foliage brilliant, while winter presents bare branches that create dramatic silhouettes. Several of the attractions enliven their schedules with nighttime tours and special events, and many feature additional activities like mountain biking and whitewater rafting. If you’re a thrill seeker or simply are willing to go to great lengths for incredible views, here are a dozen of our aerial attractions. Set in the stunning Green River Gorge, The Gorge is a three-and-a-half-hour adventure that crosses protected game lands and old-growth forests in the foothills of the Blue Ridge Mountains. It features the steepest zip line in the U.S., at 1,100 vertical feet, a distinction it holds since opening in 2013. On clear days, flyers can see all the way up to Linville Gorge, Lake James and even Grandfather Mountain located two hours away. Green River Adventures, The Gorge's sister company, offers guided inflatable kayak trips, whitewater kayak instruction and waterfall adventures. 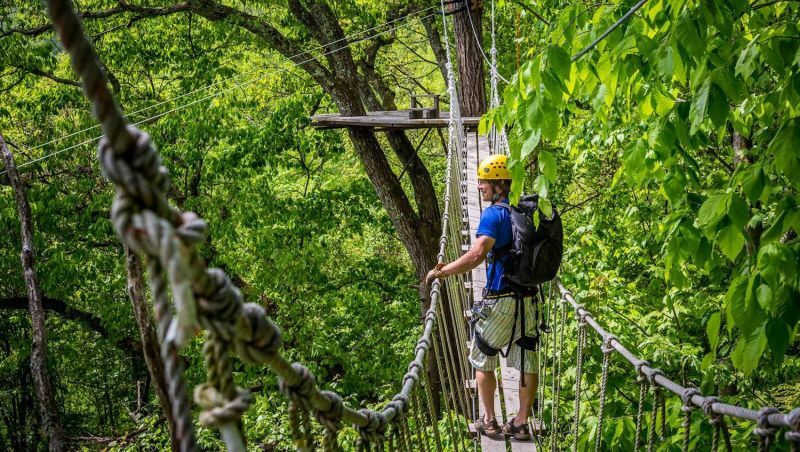 Navitat’s original zip line stretches out 1,100 feet long in sections with stops at sky bridges and artfully crafted tree platforms in between. Soaring through 240 acres in Moody Cove at heights up to 200 feet, riders cross over mountain streams and get up close with 100-year-old hardwoods during the three-and-a-half-hour excursion — the same tour Josh Hutcherson and others from The Hunger Games took in 2011 while filming in the area. Or, try the Blue Ridge Experience, a twin zip line course where you can whoop and holler alongside your friends or family. Add an RTV excursion to enjoy from the land and air. Choose between two zip line adventures— one sailing over trees, or a longer waterfall expedition that sails right above the cascades. Riders coast down lines nearly 1,000 feet long and some as high as 80 feet during the two-hour tour. The varied topography includes Carver's Falls, one of the largest waterfalls in North Carolina. For added thrills, try a nighttime ride or the Swing Shot, a high-flying, seven-story swoosh across the canopy and Carver’s Creek. Multiple options are offered at this major adventure park in North Carolina’s largest city. 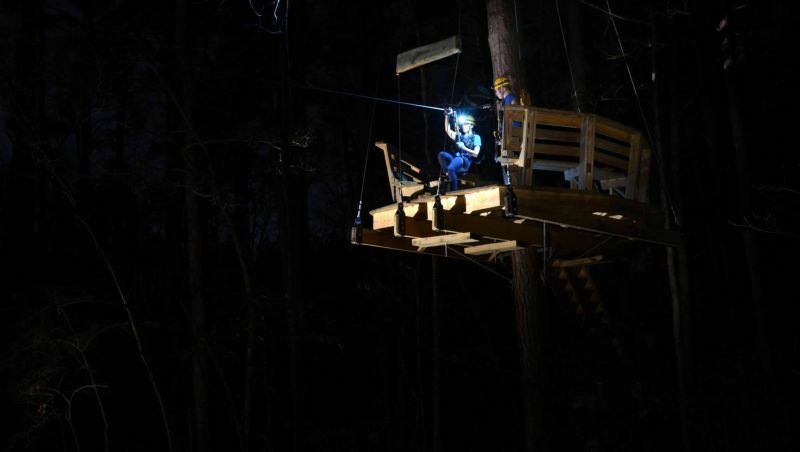 The Canopy Tour, at the U.S. National Whitewater Center zips through hardwoods along a 90-foot-deep canyon and through a wetlands delta before ending with a rappel-style freefall (twilight tours are offered in the fall). The 1,123-foot Mega Zip flies over sections of Class III and IV whitewater rapids, while the Canyon Zip is an out-and-back experience across a canyon on twin zip lines. You can add other activities such as whitewater rafting, climbing, ropes courses, mountain biking trails and jumps from 30- to 100-foot-high platforms. As the world’s largest walkable natural habitat zoo, the North Carolina Zoo is certainly an attraction that merits visiting on its own and warrants at least five hours to explore. Add the zoo’s rope course for just $12 and get in touch with your animal instincts as you navigate challenges like a plank walk, tight rope and swinging logs. Adventurers must be at least five feet tall to participate solo. 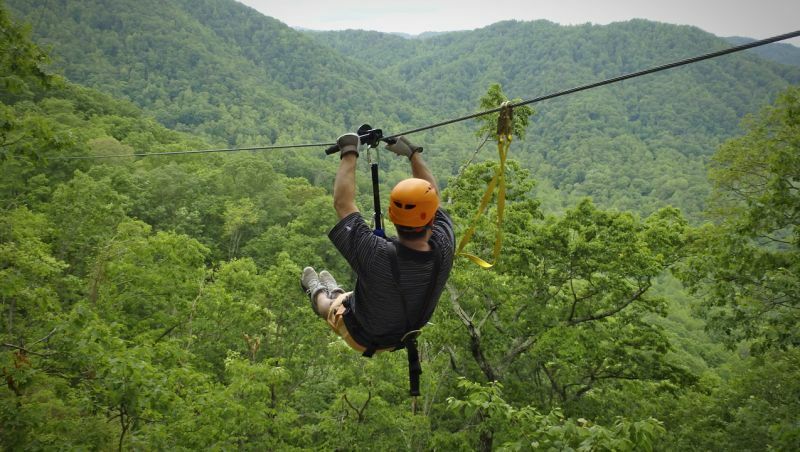 Choose from five different experiences at the Nantahala Outdoor Center Zip Line and Adventure Park, including the Mountaintop Zip Line Tour, which is a three-hour guided tour above Nantahala Gorge and includes one of the longest zip lines in the Southeast. Or, opt for the Moonlight Mountaintop Zip Line Tour to enjoy the night sky in a whole new way. If you want to spend some time in the air and on the water, go for the rafting and zip line package for a most memorable day of outdoor fun. As for the Adventure Park, test your limits from 60 feet high across wobbling sky bridges, spider webs, tight ropes and a ride on the 550-foot Wesser Zip. 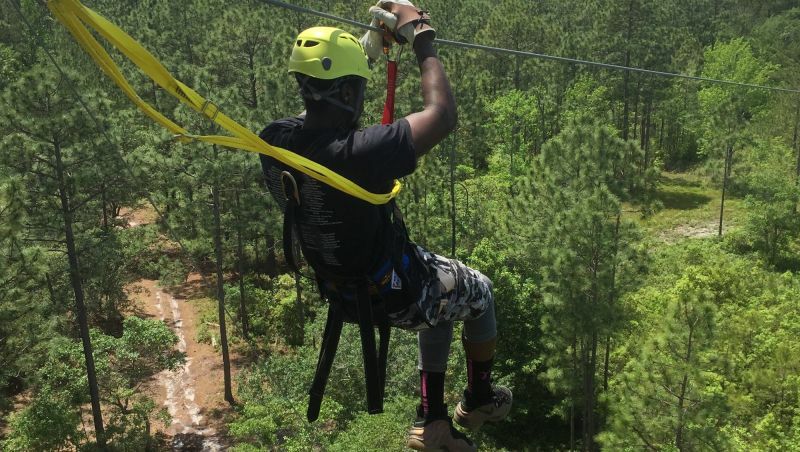 Tickets for Greensboro Science Center’s high ropes course, Skywild, pack quite a value as each pass also includes free admission to the entire facility, which combines an aquarium, museum and zoo – this treetop adventure park traverses above the zoo. You select from three levels of intensity, and embark on any number of the dozens of aerial challenges comprising zip lines and ropes courses. Parents or grandparents who’d rather watch from the ground can bring kids ages 10 and up to tackle the course on their own. The two-and-a-half-hour tour follows an aviation theme with sky decks named for airport city codes, and riders will soar to heights of 100 feet as they fly across the attraction’s corn maze and into the canopy. 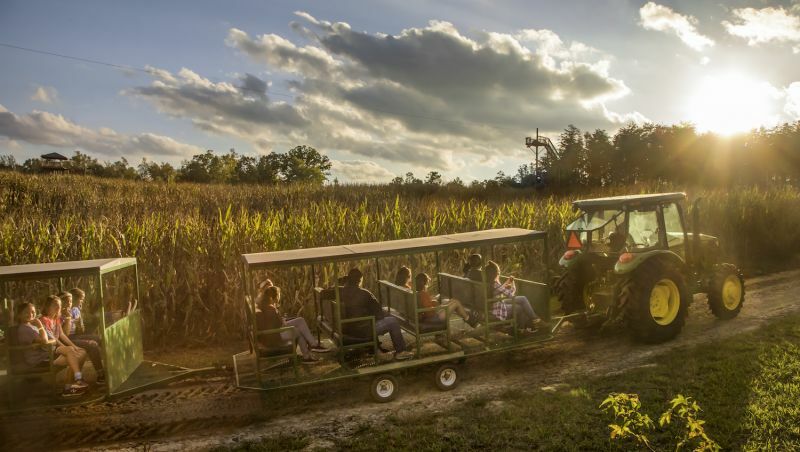 Kersey Valley garners most of its notoriety during fall, including the Halloween season when guests can also explore the Spookywoods haunted house, voted the number one scream park in America by Haunt magazine. Other add-ons include high ropes, escape rooms and lasertag. As the Outer Banks’ first aerial adventure park, First Flight offers a coastal setting that elevates the entire experience as you climb, swing and tightrope across dozens of unique hurricane-themed challenges ranging from tropical storm (easy) to Category 5 (most difficult). Returning guests appreciate that each new season brings at least seven new obstacles, and parents who want to keep their feet on the ground can opt to hire a buddy to go through the course with their kids during off-peak times. Located just minutes from the border between Wilmington and Myrtle Beach lies The Swamp Park, North Carolina’s only privately operated alligator and reptile rescue sanctuary. Guests can fly through 100-year-old cypress trees during the two-plus-hours zip line tour and get a bird’s-eye view of the wildlife that call the natural habit home like deer, turkeys, raccoons, owls, wild boar and more. Swamp boat eco-tours are also available, and you should keep your eyes peeled for the 10 American alligators that live here. When High Gravity Adventures opened next door to the legendary Tweetsie Railroad theme park in 2015, it created a convenient opportunity for a getaway filled with incredible activities. Go all in at the aerial park with The Ultimate Adventure, a six-hour experience that includes a zip line tour, giant swing ride, two ropes courses and a ground course; or just pick your favorite activities a la carte style. Then spend the next day across the street at Tweetsie. 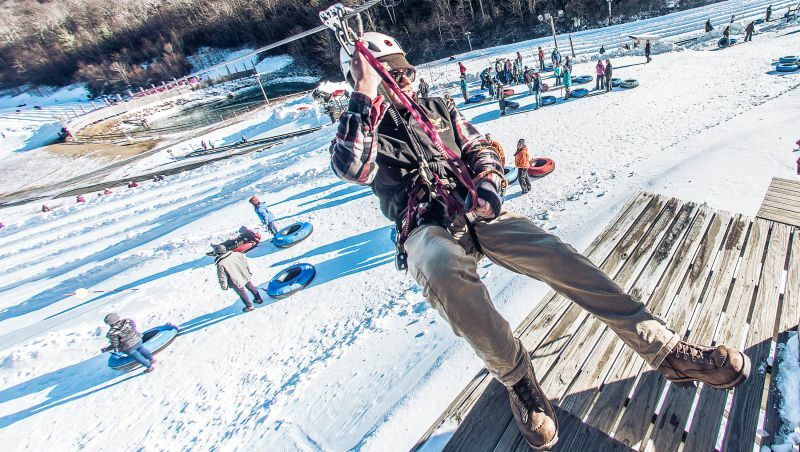 Known for its epic snow tubing in the winter, Hawksnest also features two different zip line tours, lauded for their views of the Blue Ridge Mountains. Reach speeds up to 35 miles per hour through trees and over creeks on the Hawk Tour. Or go faster, higher and longer on the Eagle Tour, with speeds up to 50 miles per hour. This is only about half of the zip lines and aerial adventure parks throughout North Carolina. Find more and start planning your trip.